Maine Deep Sea Fishing Charters, F/V Liveliner. Trips & Rates. 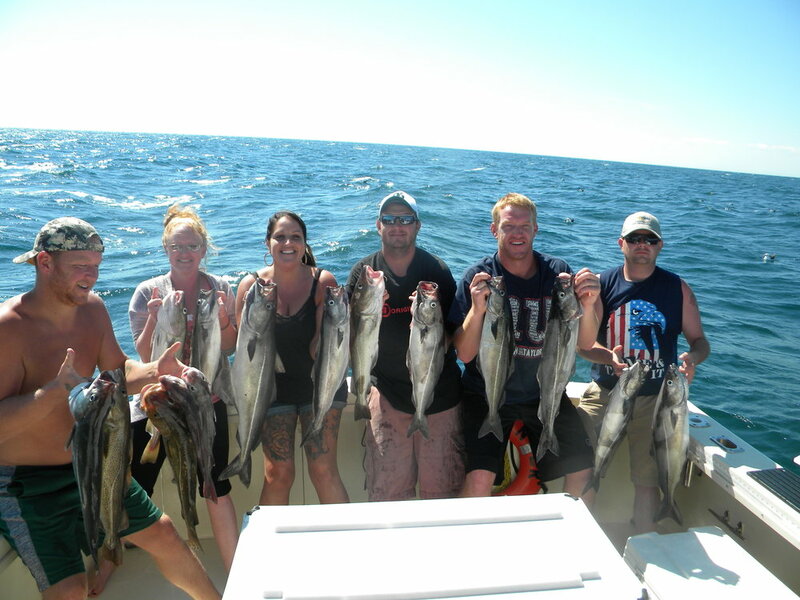 We offer deep sea fishing off the coast of Maine. Catch Giant Bluefin Tuna, Shark, Haddock, Pollock. Whale Watch Cruises. Harbor Cruises. One of our repeat customers hooked up again !!! We take up to 6 but 4-5 can be a more comfortable fit on a 31 foot boat. Approximately an 8 hour trip traveling about 30 miles offshore, fishing in 200-400 feet of water. We catch cod, haddock, pollack, cusk, hake and possibly shark. You might even get to do some whale watching. All rods, tackle, bait and instruction provided. All fish are filleted and packaged for you to take home. This tends to be our most popular trip. These are some of our most exciting and productive trips. We travel anywhere from 15 to 30 miles out, set up a chum slick and ring the dinner bell. We use Penn 50 reels, a harness to support the rod for added comfort and all bait, tackle and assistance are provided. A variety of sharks live in these waters including Blue sharks, Porbeagle, Thresher and Mako. By my own experience, I can tell you this is not just a charter for men. I have had many women on the shark trips who have had a great time. 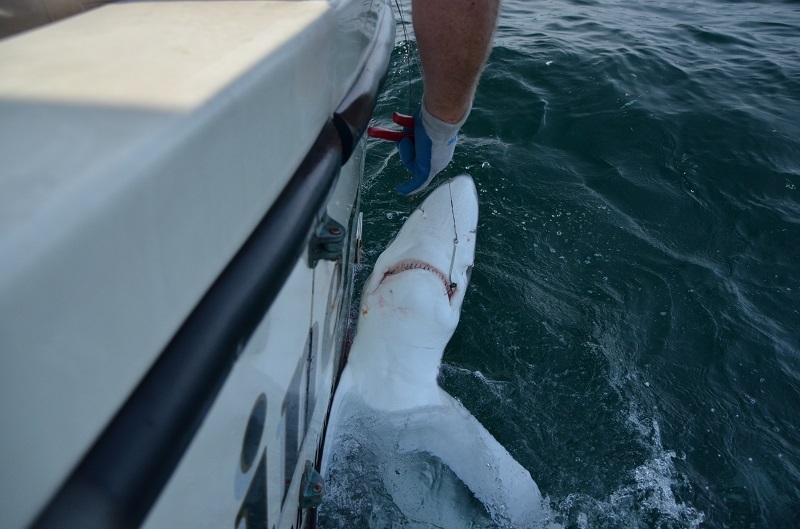 We are proud to say we've recently joined the NMFS tagging program which helps provide scientific research on sharks. Bluefin Tuna are one of the most amazing fish on the planet. They are some of the smartest and fastest fish in the ocean with the world record being close to 1500 pounds. Every season we see fishermen out of Portland harbor land tuna between 800 to over 900 pounds. It's amazing to witness the bend of the rod and hear the line screaming off the reel. I think it's only fair to tell you these trips are not always action packed, if you want action I would recommend a shark or groundfish trip. However, I can guarantee it will always be a thrill to be pursuing such an incredible prey out on the open ocean. It is also not uncommon on a tuna trip to see a variety of wildlife including whales, seals, dolphins and an incredible array of sea birds in their natural habitat. I would recommend you give me a call and we'll discuss your expectations and whether we are seeing fish in the area and overall chances. These tend to be slower trips, a big waiting game with chance of a huge payoff. *Due to federal regulations, all giant tuna over 73" are the property of the boat and will be sold commercially. This is a 4+ hour trip where we head out about 5-7 miles past famous Portland Headlight and the Islands and go to one of the ledges and fish for ground fish. Sort of an introduction to offshore fishing. We catch a variety of fish from cod to mackerel to small porbeagle sharks. This is a very popular trip and a good alternative when striper fishing is slow. This trip gives you a totally different perspective and appreciation of seeing the beautiful Maine coast from the water. We usually run these trips as 4 hour charters. These are 2 of my favorite sportfish but the availability of striped bass are dependent on several factors such as water temperature and feed. I would recommend you call me when you're thinking of booking so I can share my experience & local up-to date info on what we might expect to catch. My goal is for you to catch fish and have a great time. These trips are usually a lot of fun. We spend a couple hours on the water. Even though mackerel are not real big fish, they put up a great fight and kids can quickly learn how to catch them. The parents always enjoy the experience as well. An added bonus is you get to see the Portland Harbor and Islands as well. F/V Liveliner Charters LLC reserves the right to charge for any cancellation by the charter up to 72 hours before the charter. Any other costs incurred will also be charged. i.e. Tournament fees, mates fees, lost gear by persons. Weather is the call of the captain and deposits will be refunded if trip is cancelled due to weather and rescheduled if at all possible. 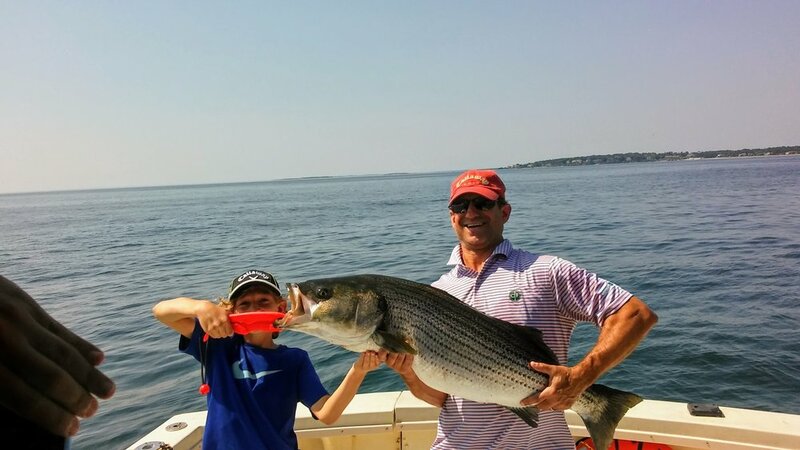 Maine has a very short fishing season and any no shows affect our business greatly. Thank you.